Mom and Dad all dressed up for a wedding. I thought I would share a little love story since Valentine’s Day is approaching and love stories are good any time of the year. 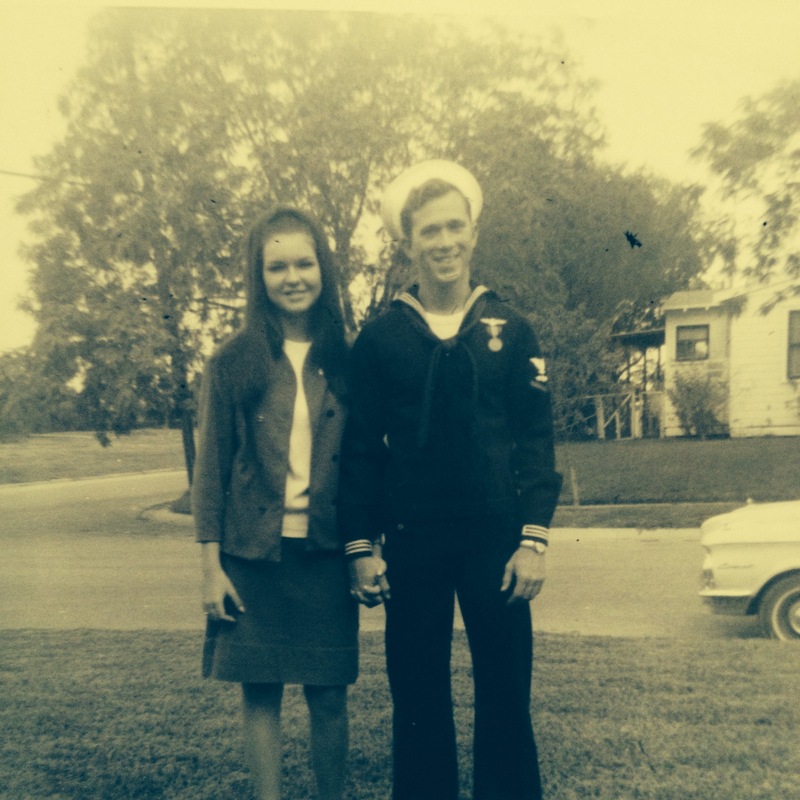 My parents met when my dad was stationed in Corpus Christi, Texas. My mom was still in high school and I think it was pretty much love at first sight. She had long dark hair and a flawless complexion. She worked on the beach and had that sun kissed skin. 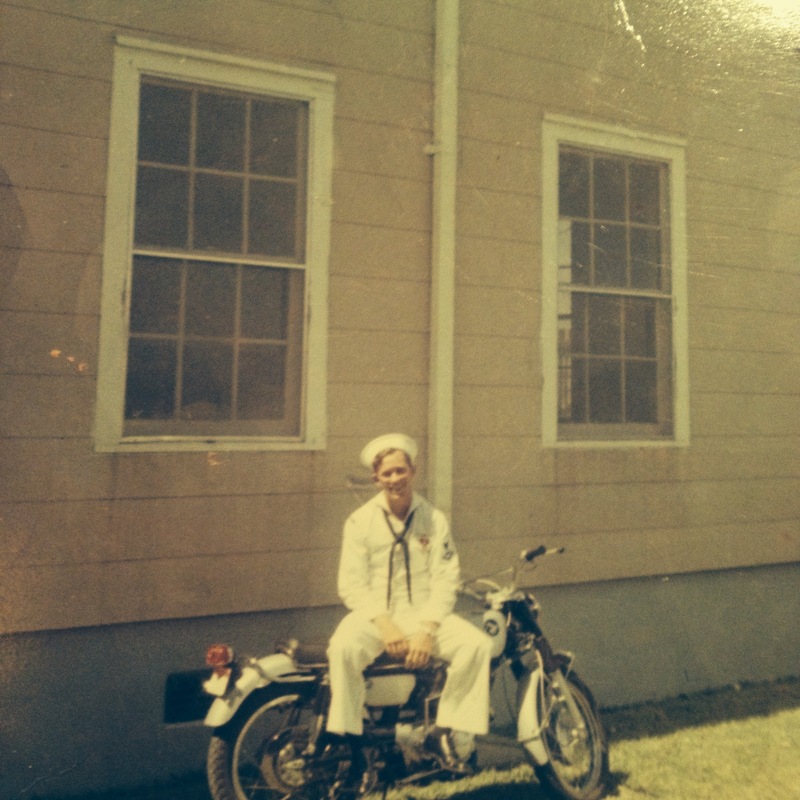 He was an athletic and handsome Navy man with wavy hair and drove a motorcycle! Dad and his motorcycle out front of his barracks in Corpus. We all love hearing them retell their stories over and over. We giggle and reminisce looking at old pictures, making fun of all the different hair styles and fashion along the way. One little loop de loop in their journey happened not long after they started dating. My dad was transferred to Imperial Beach, California where he was doing water rescue training. 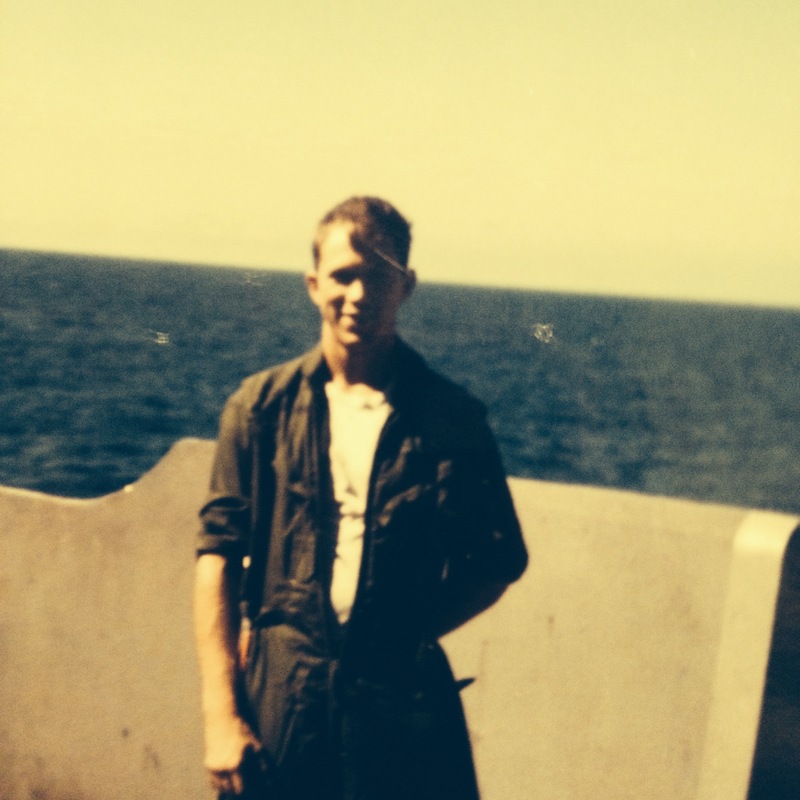 He was part of the Helicopter Combat Squadron One out of Imperial Beach and would soon be leaving for Vietnam where he would continue to serve in the Helicopter Combat Squadron. 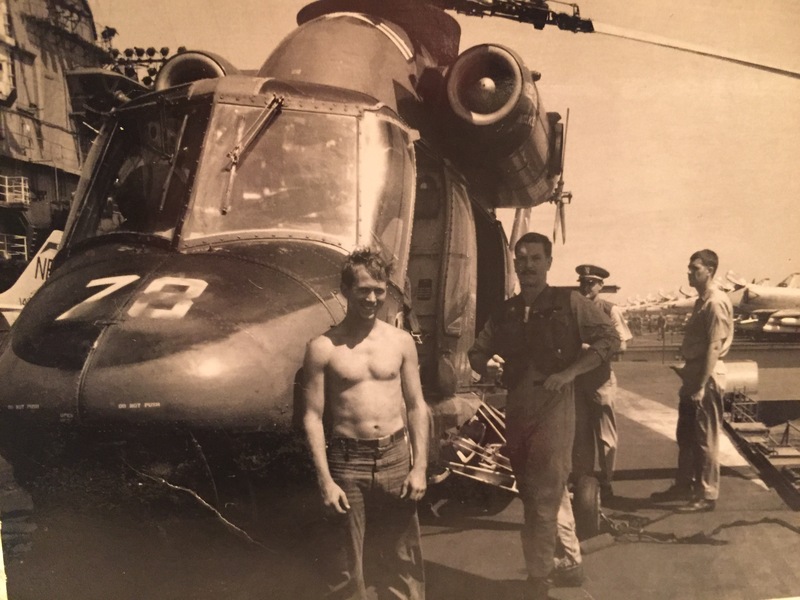 He and his crew mates flew in Seasprite helicopters and rescued downed pilots. Look at those muscles, Dad! In front of a Seasprite. News of my dad getting shipped off was hard to take for my mom so she planned to fly out to California to see him off before he left for Vietnam aboard the USS Hancock. She was only seventeen years old and had never even left her home state of Texas before so it was a big deal. I’m not sure exactly what my dad had to tell my mom’s dad on the phone to convince him to allow his daughter to fly to California to see her young Navy man off to war, but he must have said the right things. So off she flew alone on a flight, scared to death! Now I have to include in a little detail that may embarrass my mom, but when she retells the story, it’s really my favorite part . . . The night before her flight left, my mom was so nervous. Nervous to fly for the first time, nervous to go all the way to California alone, nervous to see her handsome sailor again, nervous as I think any one would be in her shoes. Well, her well meaning friend thought a few drinks would help my mom relax and calm her down a bit. So she drank a little, well actually she drank a little too much and she was just a tiny thing! She was so sick on the plane and felt so terrible during the whole flight. But, she made it out there to Imperial Beach and the young couple were reunited for a short visit before he ventured off to Vietnam on the USS Hancock. While she was there, there was a tragic helicopter accident that killed the 2 pilots and 4 crewmen. My dad dropped the wreath for the lost men over the Pacific and they both went to the funeral service. She said it was so hard to see the families grieve and I’m sure it put a knot in her stomach for the upcoming tour my dad was about to embark on. My dad remembers the huge aircraft carrier going under the Golden Gate Bridge as they left San Francisco and made their way to Vietnam. He can never keep all of his passwords straight and misplaces keys, jumps in the pool with his phone in his pocket and does all kinds of forgetful things, but one date he will never forget is the day he left for Vietnam. He can rattle it off like it just happened. I did a little Internet research just to check and he was correct – July 18, 1968. It is a date written down in the Navy logs as the fourth journey to Vietnam for the USS Hancock, but it also marks the beginning of an important chapter in the book of my parents. I’d title it Love and War. Up on the deck of the USS Hancock en route to Vietnam. Luckily, they made it through that chapter, he returned home safely. They went on to get married. Actually married twice – once in a Texas courthouse because my grandpa would not allow his little girl to leave the state of Texas with a young man (especially a yankee) unless they were married. Then a little later, they had a wedding up north so all of my dad’s family could attend. Then, they obviously had some pretty amazing kids! 🙂 Their love has endured many trials and tribulations and it’s been an incredible journey so far with lots of chapters left to be written! One of my favorite photos ever! 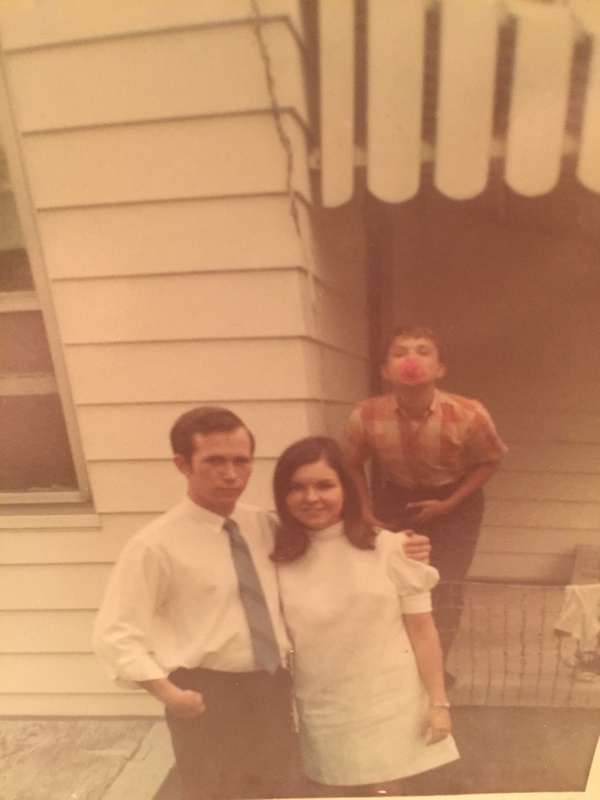 My mom and dad on their wedding day and my uncle Mike photo bombing in the background! 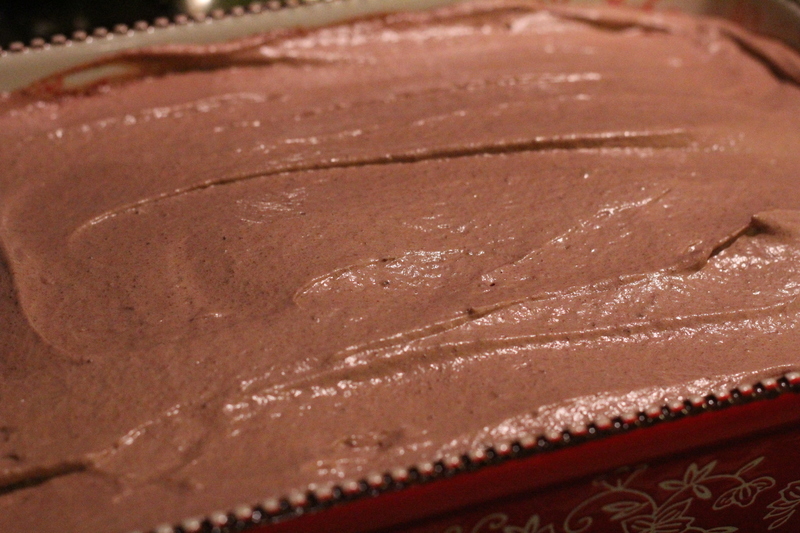 I thought a little chocolate dessert recipe would pair nicely with my love story. I’d consider this Italian Love Cake a cross between cheesecake and tirmasu. I did not create this recipe, but came across it while searching for a dessert to take over to a friend’s house for dinner. There are several versions and recipes out there, but I chose the one from theseasonedmom.com. They all liked it a lot and agreed it was blog worthy so here it is. It’s so easy to throw together and is impressive to serve with it’s layers of goodness. And, it’s just in time for a certain holiday. 🙂 I can’t wait to make it for my love bird parents when they come for a visit! It’s so simple to make and tastes wonderful. It’s best if you can make it the day before and let it chill out in the fridge. Keep it cold. Mix up the chocolate cake mix per box instructions. Combining ricotta, sugar, vanilla, and eggs. Pour cake mix batter into bottom of oven safe slightly greased 9 x 13 pan. Then pour the ricotta mixture over top. 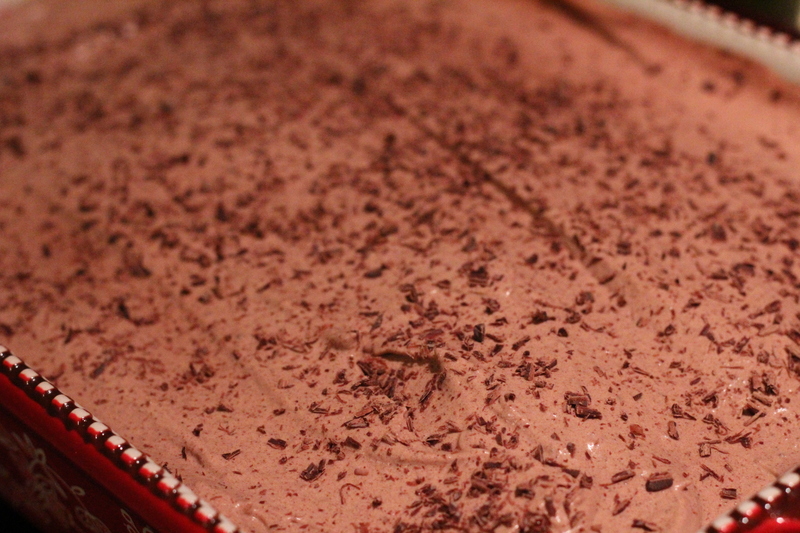 And smooth – be careful not to mix the layers. Bake in the oven at 350° F for one hour. Peek to see the magic happen if you dare. 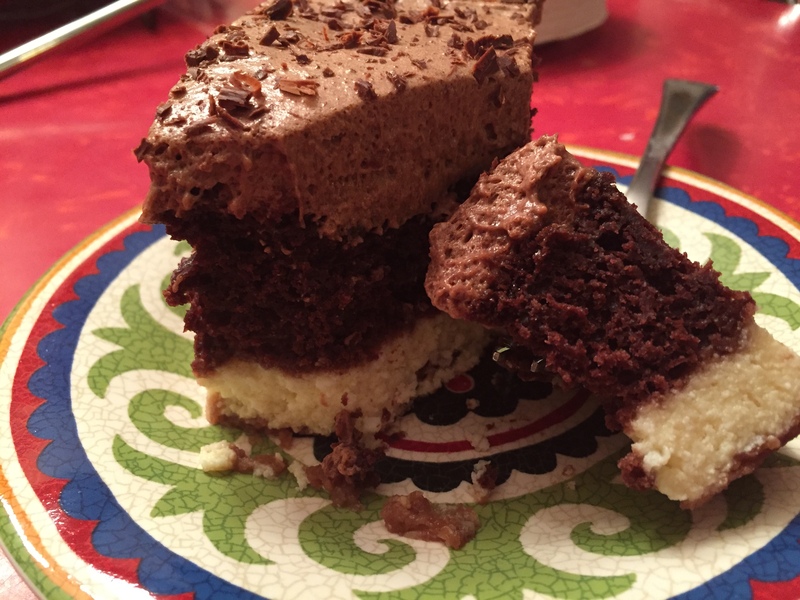 Ricotta sinks to the bottom and the chocolate cake rises to the top like a champion. Mix up the pudding, milk, and Coolwhip for the topping. Spread this evenly over the cooled cake. 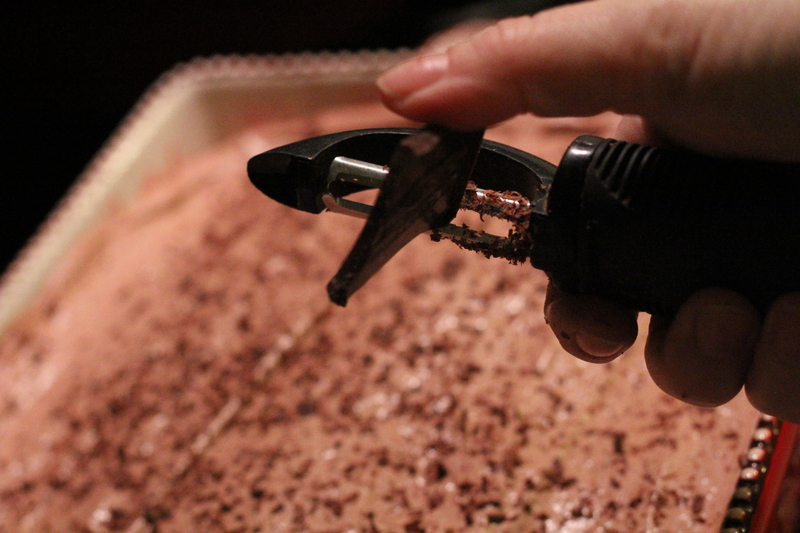 Sprinkle chocolate chips or grate chocolate over top of the cake to finish it off. Let this chill in refrigerator for a good couple hours, but overnight if possible. The longer the better. Then slice and serve and boy o boy, will you enjoy! Look at those layers of love! 1 package chocolate cake mix and ingredients called for on the cake mix box. Grated Chocolate, mini chocolate chips, or whatever garnish you like. Spray 9 x 13 oven safe pan with non stick spray. 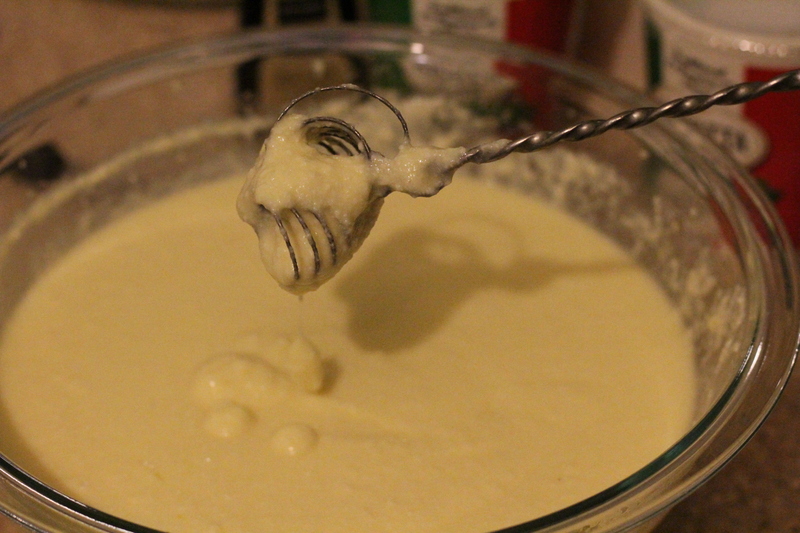 In a large bowl, combine the cake mix ingredients per mix instructions. Set this aside. 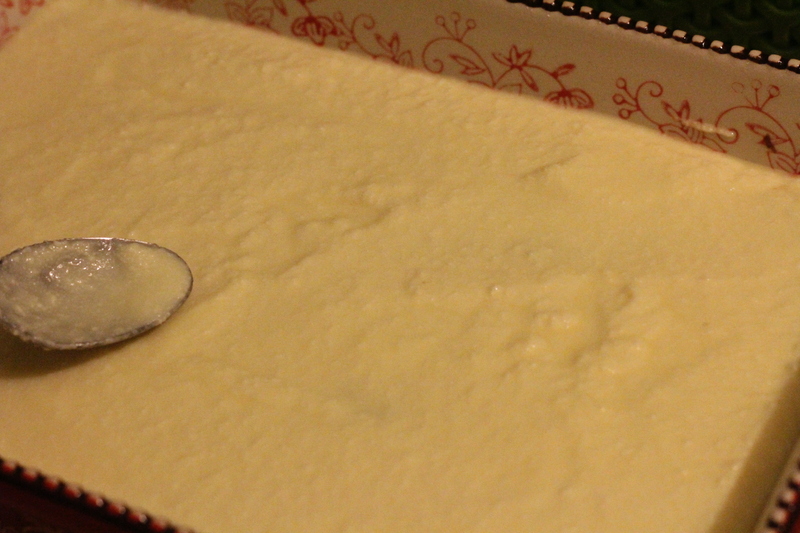 In another bowl, combine the ricotta cheese, vanilla, eggs, and sugar. Mix this until combined and smooth. 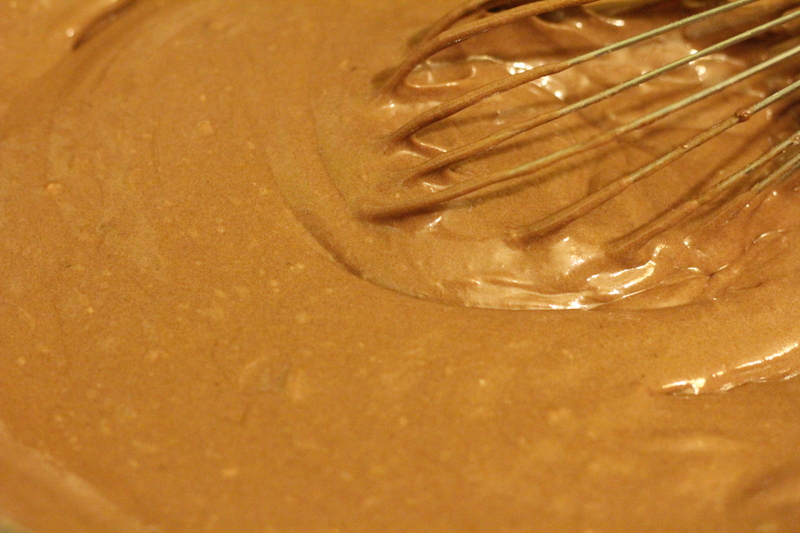 You can use a hand mixer or just a good whisk. 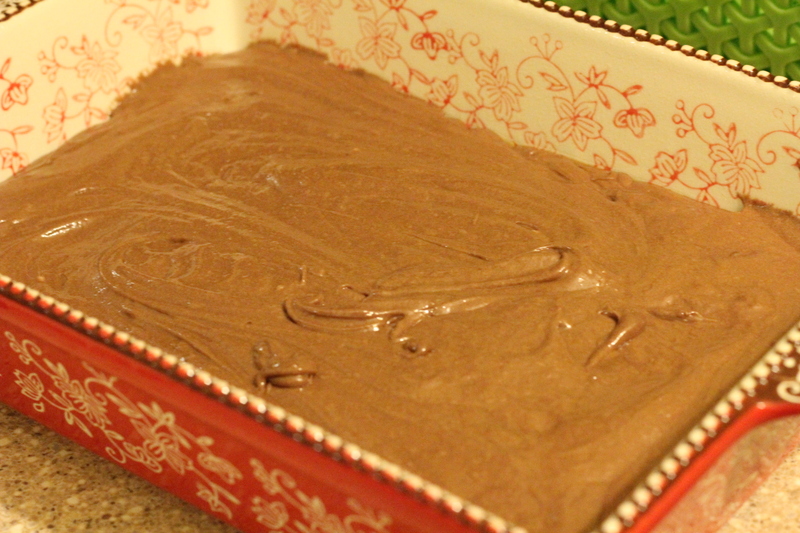 Pour all of the chocolate cake batter into the baking dish in an even layer. 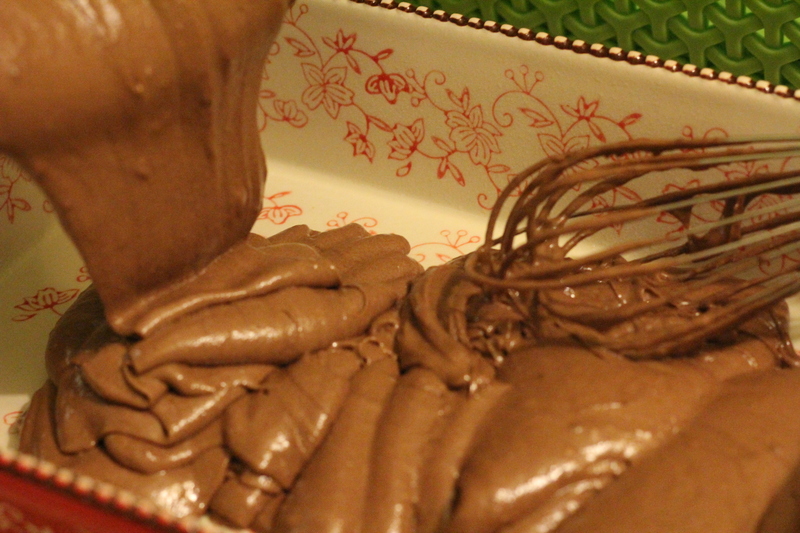 Then, pour the ricotta cheese mixture over top of the chocolate batter. 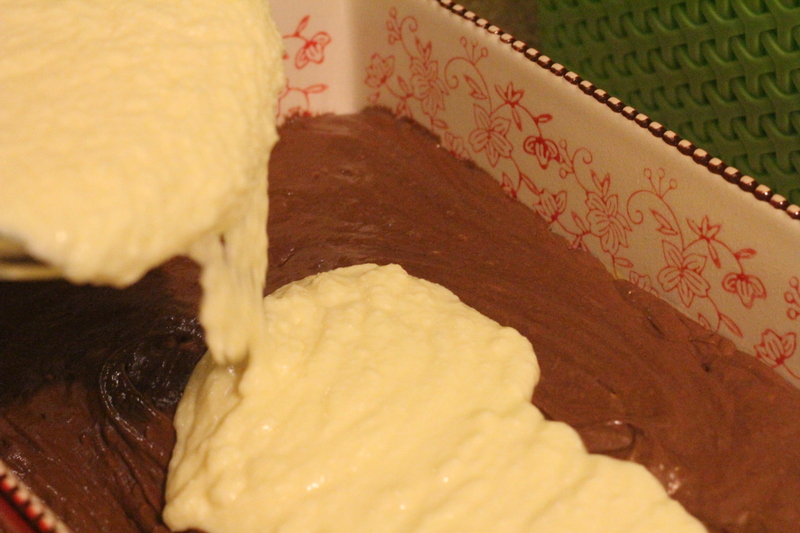 Gently smooth the ricotta mixture out so that it’s even, but be careful not to disturb the chocolate cake batter layer. 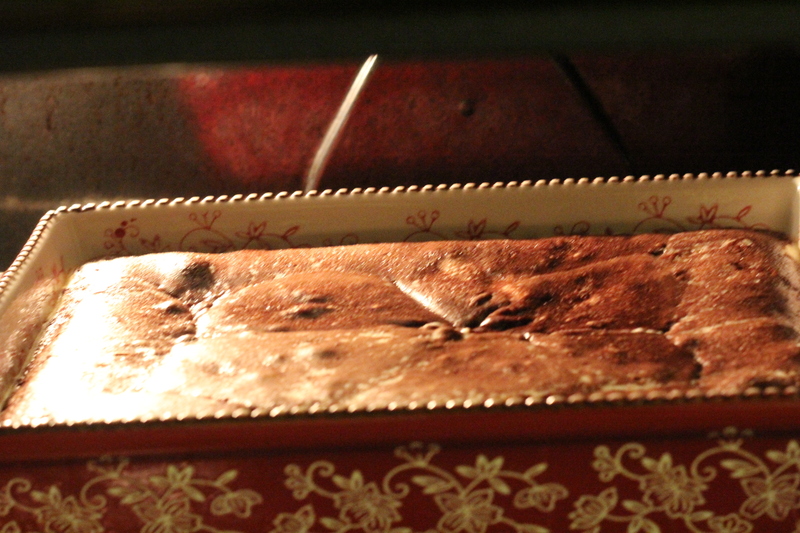 Bake this uncovered for 1 hour at 350° F. During baking, a magic mystery will occur. The layers will switch. 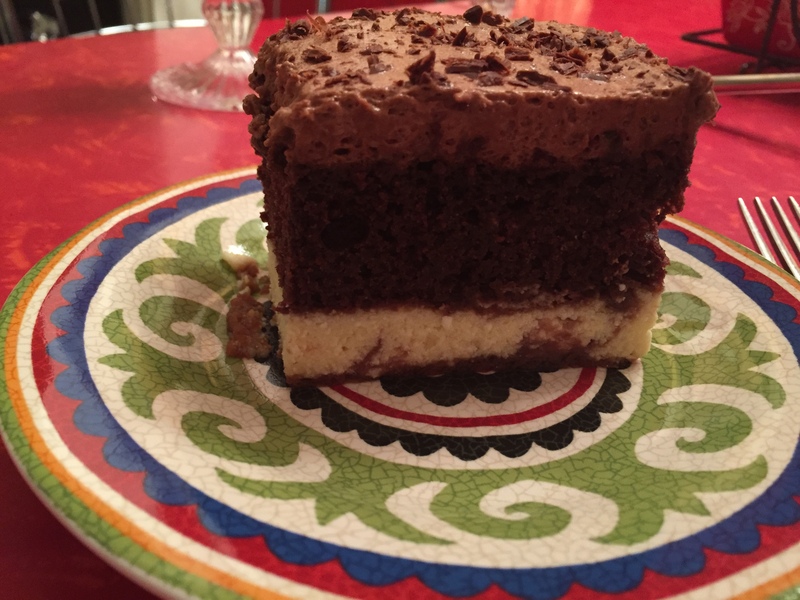 The ricotta layer will sink to the bottom and the chocolate cake layer will rise to the top. 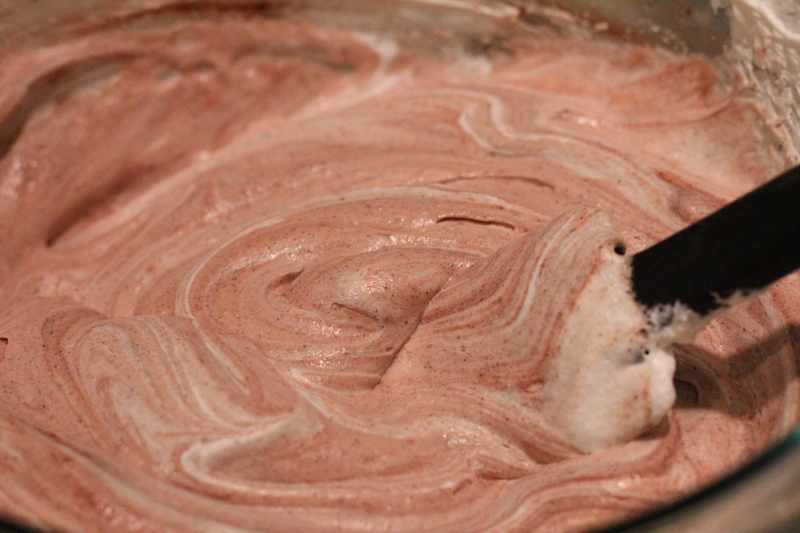 For the frosting – Combine the whipped topping (Cool Whip), milk, and instant chocolate pudding. Spread this over top of the cooled cake. Garnish with grated chocolate or chocolate chips. I used grated dark chocolate. Cover and Refrigerate at least 2-3 hours, but preferably overnight so the flavors have time to enhance. When you slice and serve, you can see the layers of the cake in all it’s beauty.